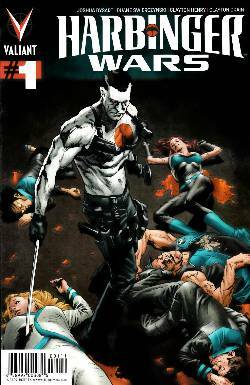 HARBINGER WARS, Valiant's first family crossover event, begins here! A decades-old secret is about to put BLOODSHOT and HARBINGER on an inescapable collision course - and, soon, the most powerful forces in the Valiant Universe will be drawn into a battle without sides, without rules, and without mercy. o Two dozen undisciplined, untested and untrained superhuman children have just escaped from a top-secret research facility and into the world. o When Bloodshot, Toyo Harada and Peter Stanchek join the chase, will the Valiant Universe be ready for its first all-out superhuman showdown? o Start reading here for a high-stakes tale that will put Valiant's greatest heroes to the ultimate test!